SANTA MONICA, Calif., May 20, 2014 /PRNewswire/ – Only about 20 percent of car shoppers consider themselves “extreme price grinders” who will take as much time as they can to get the lowest possible price on a new or used car, according to a new report released today by Edmunds.com, the premier destination for car shopping. 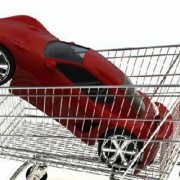 In fact, says Edmunds.com, a clear majority of car shoppers (64 percent) value the importance of saving both money and time in the shopping process. 66 percent of shoppers say that they are likely to request guaranteed upfront pricing on a new car, and 82 percent of shoppers prefer to have a price guarantee on a VIN-specific new car, as opposed to a vehicle configuration that may or may not be on the dealer’s lot. 100 percent of smartphone owners surveyed say they used their device to perform some sort of car shopping activity, typically for vehicle and pricing info. On average, during the shopping process purchasers will visit two dealers and take two test drives. Only 58 percent of respondents say they test drove a vehicle before they made their most recent purchase. 83 percent of car shoppers say that they come away very or somewhat satisfied with their dealership experience.